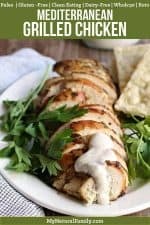 This Mediterranean Paleo Grilled Chicken Recipe + Spiced Creamy Sauce has a nice basic marinade that you will find delicious. Like many of you, I eat lots of chicken. It gets really old really fast, so I am always trying to come up with new ways to eat chicken that are simple and delicious – like this Paleo Grilled Chicken recipe. It’s crazy how just adding some spices and changing things up a bit can turn something from plain to delicious. That’s the case with this dish. It’s a good basic marinade for your chicken, and then you can take the basic recipe and make it your own. It’s really good grilled, or you can even bake it or pan fry it if you want. It’s best if the marinade sits at least 4 hours, but if you only have 15 minutes to let it marinade, it’s a whole lot better than plain chicken. 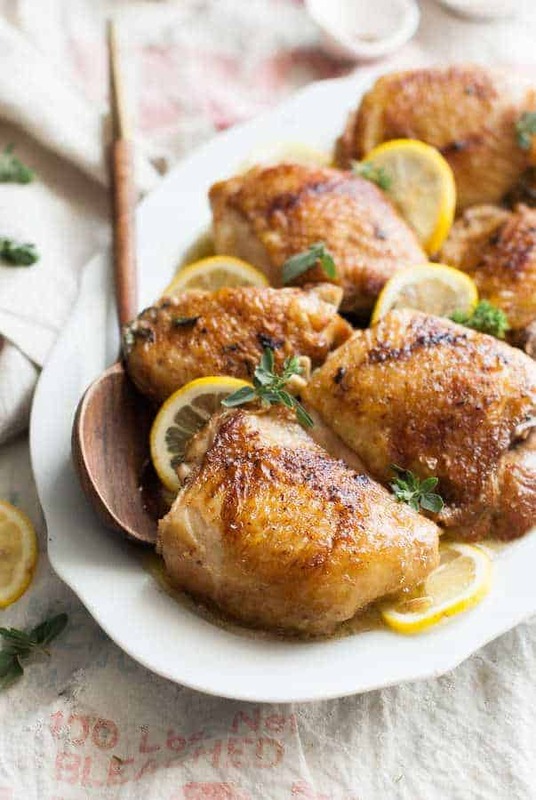 I used boneless, skinless chicken breasts, but this would be really good with chicken thighs – with or without skin and bones. I made this on my flat top grill in my house, but you could just as easily make this on your grill outside or smoke them in your Traeger smoker, if you are lucky enough to have one, like me. After using our Traeger, we’re never going back to a gas or charcoal grill again. As my husband says, we’re grill snobs now. 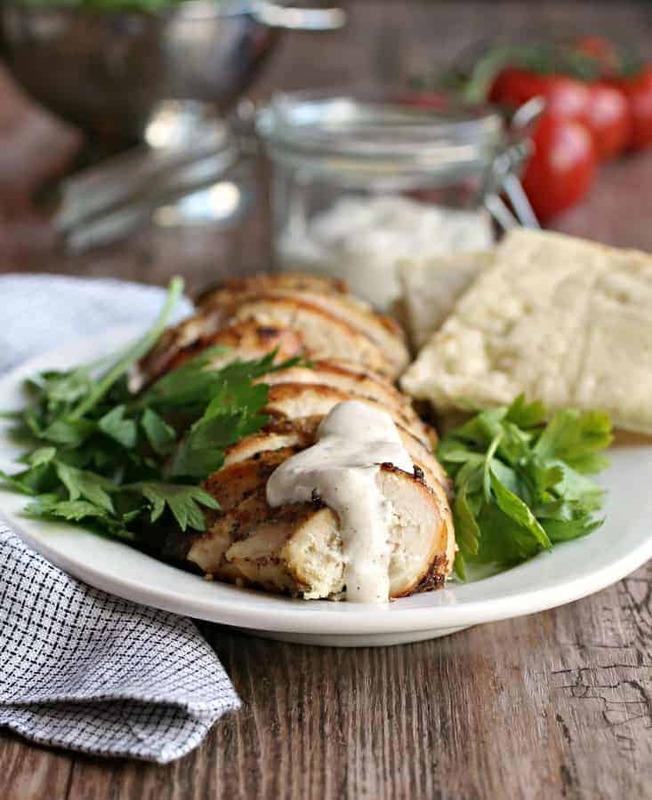 A way to make this taste better is to use better chicken, like free-range chicken. The taste difference is very noticeable – and it’s healthier to eat chicken that isn’t full of antibiotics. The main problem is that free-range chicken isn’t cheap. One way I have found to buy it more affordable is to buy it in bulk online. Click here to see where I buy my chicken and other Paleo foods online. 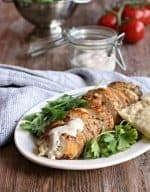 If you want to see more lists of Paleo chicken recipes on my blog, please click here and there are lots of choose from. Click here to to get my clean eating pita bread recipe. In an effort for you to get to know my family a little better, I thought it would be fun for you to watch one of my many attempts to entertain my children. I had them do a tower challenge. The object of the game started out to build as tall of a tower as you can with Dots and spaghetti, but the spaghetti didn’t work very well, so we switched to toothpicks. Watch the video to get to know my children a little better and to see who won! I think this would be a fun activity for a family party, birthday party, family reunion or just with your own family or friends for fun. It’s easy to buy the ingredients, gives you an activity and then it’s fun to eat the ingredients after. You could also try it with different candies, like gumdrops, orange slices or maybe even gummy bears. It would be fun to experiment with different candies. I like how this has a simple marinade that makes it taste really good when I grill it. And then the dipping sauce only has 5 ingredients and complements the chicken really well. Combine the marinade ingredients in a plastic bag with the chicken. Refrigerate 4 hours or overnight. Grill approx. 15 minutes each side until done. I used an indoor grill pan and it worked fine. This is a wonderful recipe! This looks pretty easy to make. I bet it tastes good with that sauce on it. Yum! 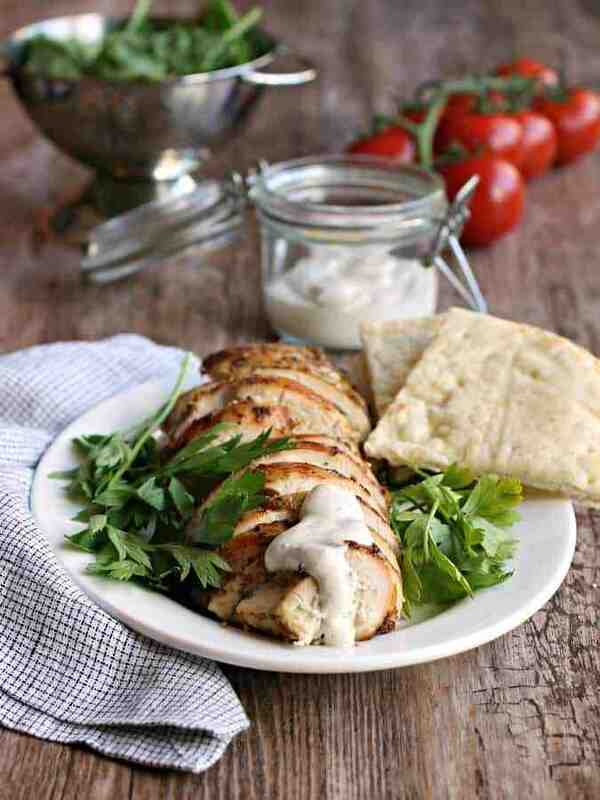 This is such a delicious dinner option!